This video shows the basics of using the Proposal Pack templates without using the optional Wizard Word for Windows Add-in software. See how to customize a document using the preassembled templates, the chapter template library and the completed sample proposals. Also see how to insert your own logo and graphics. In this video we're going to show you the manual way to use the Proposal Pack. This is for use when you are not using the Wizard software. Mac users and Windows users who are not using Microsoft Word can use it this way. First you want to find the Proposal Pack material. On Windows you'll have seen a desktop icon installed for your Proposal Pack. This has a red background with our logo on it and the title of the actual Proposal Pack you purchased. Since Proposal Pack has hundreds of design themes. Whichever design theme you purchased is what the visual look you will see. We're going to be using our Proposal Pack Real Estate #5 for this video demonstration. If you lost this icon on your desktop you can also look in your Windows Start menu and scroll down to your applications down to the Proposal Pack and you might find it there and also you can go straight to the folder on your hard drive where you installed the Proposal Pack. For Mac users, when you downloaded the Proposal Pack it will have downloaded into a folder called ProposalKit in your Mac Downloads folder. You can then drag that out of the Downloads folder and put it anywhere you want on your Mac. For Mac and Windows the structure and files are 100% identical so when you click into the folder with all of the actual material you'll see it look like this. There'll be some folders. There'll be some Word documents and there'll be a couple files OpenProposalPack and StartHere. When you double click this desktop icon on Windows it's actually opening this file OpenProposalPack in your browser. Same for Mac, when you open this folder on your Mac you'll see the same set of files. You'll see a number of Word documents here. These are what we call our preassembled documents. The interface to browse through and navigate all the material more efficiently. You can click either one of these two files StartHere or OpenProposalPack. The manuals will be in these PDF documents and these folders contain all the actual documents. It's actually easier to use the desktop organizer OpenProposalPack or StartHere to browse through all the samples and the documents. If you want to see the documents you can go into the Spreadsheets folder and you'll see all of our pre-made Excel calculators. You can go into this Word folder and this will be the library of thousands of chapter templates. How the Proposal Pack works is how you pick and choose a collection of these chapter templates and paste them together becomes your document. For example, every one of these is a single page chapter. You scroll down to the C's, you'll find the Cover Letter. You'll find a second Cover Letter it's a little more tailored for a business plan. The Cost Summary is common one and so on. Now our Wizard software will automate pasting these pages together for you more efficiently. We're going to show you the manual way to do it. So let's get out of this organizer. Okay, so double-click your desktop organizer or go down here and click the StartHere or OpenProposalPack and it'll open up a web browser with our organizer. Now this uses your web browser but is actually browsing through folders on your hard drive so everything is actually on your computer. You're not using the Internet. So this is how you can get to all the sample proposals. These are the PDFs that are pre-written so you can get writing ideas. These will take you to various categories of chapters so you'll see the Cover Letter we just showed you. The actual document for it. If you click these Open Document links it's actually just going to launch those Word documents we showed you in that folder. These Situations are just groupings of those 2000+ chapters by category. So for example, these pages will show you just the ones that are real estate related or if you want more general categories - service sales, projects, business plans and so on. So, to get started manually we want to open a preassembled document. Now these links to open these are the same Word documents in that folder we showed you a moment ago. We've preassembled a number of documents for some more common general purpose situations. It's easier to start editing one of these preassembled than to just start pasting individual chapters together from scratch and we'll show you why in a moment. So let's open the Business Proposal template and you'll see this starts with our plain Cover Page, the graphical designed Title Page, a Table of Contents and then what we call body pages. Each one of these with the chapter header was pasted in from that library of 2,000+ chapters. And we ended with another graphic designed Back Page. Now the reason why it's best to use our preassembled documents is to create a Word document like this you actually have to split it up into what's called sections. Everybody should be familiar with how a Word document starts out with a single blank page and you just type away. But what happens is if once you start using headers and footers for a more complex document where you want headers and footers to be separated from each other so they don't interfere with other pages that follow them you have to start using sections in Word. So if we click this paragraph symbol, that will turn on the Word symbols so you can actually see this in action at the base of our Cover Letter we have a Section Break which is different than your common Page Break that you should be familiar with. And each section is separated in its headers and footers from the section that follows it. This allows us to have a plain page Cover Letter with nothing in the headers and footers followed by a Title Page design. Now the background image is actually contained in the header. If we double click into the Word header we've actually selected this 8.5x11 background graphic which is a single picture with our stock graphics in it. Because Word will replicate anything in the header and footer down to every page after it, that's why this Title Page is in the second section and its headers and footers are separated from the page after it. This is actually the Section Break that separates this Title Page from the next section. Now the Table of Contents, you'll see a Page Break. Now we're using normal Page Breaks because every page in the main body of our proposals we want to be able to use page numbering and a footer that gets replicated down into every sub page. The way Microsoft Word works is when you put something in a footer or header it replicates down into every single sub page that follows and in the case of page numbering that's how you get automatic page numbering. So you'll see now that we're using this footer that is replicating into every page after it and we're using normal Page Breaks. So this third section of our document contains all of the body chapters. I'll scroll all the way down to the end here. Now you'll see the Guarantee page is the last body page in section 3 and we've ended it with a Section Break. That is because we do not want this footer to replicate down into our Back Page. You'll see the Back Page doesn't have a page number. We also don't want any background images because you'll see these body pages have a background image. It's actually this little sidebar that's in the header of the Title Page and it's being replicated down into every sub page so we do not want our background header graphics and our footers to replicate into our fourth section which is our Back Page. So that is why you should start with editing our preassemble documents because it's a little more complicated to set up a Word document with multiple sections if you're not that familiar with these Word features. Now if you're using our Wizard software, our Wizard software actually generates the document with these sections all separated from each other automatically for you. Does all that work. So we'll turn off our paragraph symbol. So the one thing to be careful of is as you're editing just be careful not to delete these Section Breaks. If you actually see your document just all of a sudden replicate the information from a section above into every page after it you probably just deleted the Section Break. You'll just have to undo that. Okay, so this is just plain text editing to edit. Our Cover Letter with the Title Page these are just text fields. You can just type in your own information into these. Anything with tags is meant for you to just replace with your own information. These tags are actually replaced by our Wizard software from the data you entered for your projects using search and replace. Manually you're just going to type over the top of these. Now the Table of Contents is an actual Word object. You click it, it'll light up the entire box and you can right-click and say Update Field and you can update just page numbers or if you've made changes to the actual chapters Update Entire Table. And that will cause this Table of Contents to automatically renumber and reorganize itself. To edit headers and footers double click at the base of each page. That'll put you into the header and footer and you can edit this. Type in your website address or your company name or whatever you want. We could change here, it will automatically replicate into every page after it. We'll close the header. Also you might notice when we click into the headers and footers the colors in the graphics become their normal colors. The way Word works is when you were in the body and not in the header and footer background graphics will be a little more muted. That's normal, when you actually print or save as a PDF the full colors of these background graphics and designs that are in the footers and headers will come out. So let's say we want to delete a page. That's actually pretty easy. I'm going to click the paragraph symbol so you can see everything we're removing. So I'm going to click the paragraph symbol. You'll see some hidden fields. This is how we build Word Table of Contents. When we have graphic headers because Word cannot see the words in these graphic headers we put hidden TC fields that define the name in the Table of Contents and Word builds its Table of Contents from all these TC fields it finds. 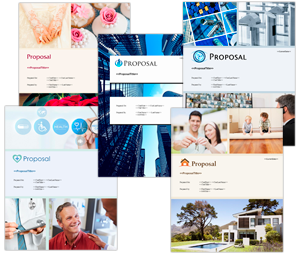 Now if you're using our Proposal Pack for Any Business or our Proposal Pack for Government Grants design theme. Those use actual text and no graphics in these headers and does not have a TC field. They'll just be a straight text and it will build a Table of Contents off of the actual text. That also gives you the ability using those designs to edit and change your chapter headers. So we're going to delete this Products page. Click the delete key a couple more times, remove our page break and that pulls up the page after it into that space. Now we can rebuild the Table of Contents. Remember we removed the Products page. And a right click, Update Field and you'll see the Products page disappeared in the pages after it. So now let's say we want to add a page. How do we do that manually? Well first let's find a location where we want to add a new page. I'm going to use the paragraph symbol. I like using the paragraph symbol because I know that I'm seeing all the hidden formatting while I'm making edits like this. So I'm going to put the cursor in front of my TC field. This is why I want to use the paragraph symbol because I want to make sure that these TC fields stay where they're supposed to are so I'm going to put the cursor in front of that TC field, click Insert > Text > Object > Text from File. I'm going to browse to where our chapter templates are. Let's say if I wanted to add the Site Planning chapter. I'm going to scroll down and select the Site Planning chapter. It'll say Insert. Now you see the Site Planning page has been inserted. I might want to put an actual Page Break here. Now if we turn off our paragraph symbol we'll see the Site Planning page. Now we want to make sure the Site Planning page is in our Table of Contents. So let's go back up, right click, Update Field > Update Entire Table and now you see Site Planning is built into our Table of Contents. That's one way to get a chapter in here. What if we want to use the browser to add a page. Let's insert another page right here above Services Provided. I'm going to put my cursor right before the TC field. When I say Insert > Pages > Page Break, now that just added a blank page and put my cursor kind of right in front of that page break. Let's browse for a page using the desktop organizer and maybe want to search by some real estate chapters since we're doing a real estate proposal. Site Planning, that's the one we just added. Let's add a page about say Furnishings you can click the Open Document now. That opened the Furnishings.doc chapter from that folder. The same folder we pulled in the Site Planning page from. Now you'll see that this is a little plainer looking. It doesn't have any colors in the background. It doesn't have any sidebar graphic. That's because we're only pulling in the body page. The headers and footers in the actual assembled proposal here are defining the colors and design of the background. So now we can just do a copy/paste. We can select all CTRL-A, right-click your mouse, copy. Now we'll just put our cursor over here right in front of our page break and let's do a paste keeping the source formatting. Let's turn our paragraph symbol back off. Now you can see the Furnishings chapter has been added. I can scroll back up. Let's update our Table of Contents. And now Furnishings is added. So this is how you can customize our preassembled templates adding and removing chapters as needed and updating the Table of Contents. For pricing information these tables are just plain text. You can just type over these tags, add your own category information, add your own line items, put in your own prices. You'll have to do your own calculations. Now if you want to use some editable spreadsheets, every chapter template that has financial information associated with it say a Cost Summary or so on has an associated spreadsheet that we've pre-made and you can open these from this desktop organizer. Let's find the Cost Summary Excel calculator. We'll open the spreadsheet. Now these are pretty standard format spreadsheets so these spreadsheets we've already made calculations and cells for you to do totals and everything. You can just type in line items, update your pricing, get your calculations, calculating taxes, all the standard stuff. There's also multiple sheets say this Sheet1 has 20 line items for just products and services. You can actually use that for anything. Ongoing yearly, monthly and miscellaneous. These other sheets just change the calculations around a little bit for different situations so you can just look through the sheets and find one that matches your situation a bit better. For example, some sheets let you have multiple sub costs that can roll up to the calculations for a single line item here. Others are a little more simplified. This one just has a straight list of 40 line items, no categories. So pick a sheet that'll suit you and you can do calculations and then you'll manually type in totals say from these spreadsheets back into the Word document. So that is how you customize the preassembled documents. Now if you want to get some sample content we have added editable versions of all of our samples. So say we're doing a real estate-related proposal and we want to see some actual sample content. Maybe we want to copy a Cover Letter or something. So if you find a sample that suits you, you'll see how this sample has a filled-in Cover Letter or as in our preassembled template it's more of an instructional fill-in-the-blank that you have to fill in yourself. So we're going to copy this text with our mouse, highlight this instructional text in our Word document and paste it in. You can select an option, that'll give you the best results here. And you'll still have to do a little manual reformatting of this text. Now another option, I'll just undo this. So you notice these samples are rendered PDFs so you can copy and paste pieces of text out of these samples and reuse it just as I showed you. Another way is each sample has editable Word document versions of its text. So we could open this Cover Letter for the sample and it's a little more formatted and tagged than just using the copy and paste from the PDF. Here I can do a copy/paste of this samples Cover Letter and it's formatted and tagged, ready for you to replace your information into these tags and you've got some pre written Cover Letter material to work with. Same with any of the other chapters. For each sample you can pull out the text from the sample. I'll show you that side-by-side here. So we'll just scroll down to the Market and Audience chapter. Market and Audience, so you'll see the PDF version a little more formatted with the samples design theme, the editable text version where some of the contact information, the more personalized information, has been replaced with tags. All the formatting has been removed and these are the ones you want to copy and paste if you want the easiest way of editing. Now our Wizard software when it generates a document and you decide to import the content of a sample will basically be doing these steps for you. It'll be copying and pasting this text over the top automatically versus how we're showing you manually. So everything the Wizard can do like this you can do manually, it's just a little more extra labor. So that is basically everything you need to know for editing documents manually using the Proposal Pack templates the most efficient way. Now what if we want to change the logo for example. That's fairly common. Most people want to put their logo onto the front Title Page. Now you'll see that this Real Estate #5 design has a very specific design theme and color to it. So you'll want to pick a design theme usually that looks good with your logo when you're intending to put your logo on the proposals. That's one of the reasons our Proposal Pack for Any Business is the most popular for customizing with your own logo design and color scheme because it may clash with anything like our pre-made design themes might. Now to replace a logo is fairly simple, that's just a basic word processing feature. You can just highlight the graphic in the document. Because the word 'Proposal' here is more of a placeholder it's a little redundant to have the word proposal on your proposal document sometimes so this is actually intended for people to replace with their own logo. So we can delete our Proposal graphic then we can say Insert > Picture and you then browse to where your logo is, click Insert and your logo will be inserted in that place. So we're going to show you using one of the stock pre-made graphics. So every Proposal Pack has a series of graphics included and you'll find them in this Graphics subfolder. The Proposal graphic is the one that's already in the documents to start, right here. Say we want to change that to something else. We can say Quote or Estimate. Say if we're not writing a proposal but we're writing an instruction manual or a policy document or a business plan these are all options for changing the graphic on the front Title Page to suit the type of document you're actually writing. So let's just say we're writing a quote instead of a proposal. To now say Quote we'll insert that. Now whenever you insert a graphic in Word it's going to be static so I can't drag it around. So I want to right-click this graphic that I just inserted, bring up the Format Picture by right-clicking it. I'm going to change the Layout. See its layout goes in by default as Inline with Text and you can't move the graphic around on the page to reposition it. So I'm going to say In Front of Text. Once I do that you'll see the outline change to corner dots. Now I can drag the graphic and position it anywhere I want on the screen. So I'll just put it back in this spot. And that is how you change the graphics and insert your own graphics. Now see in this design theme we're using a photo design what if you want to insert your own pictures over the top of these. This actually is easy to do. Double click into the header and you can insert just using that same Insert > Picture > From File. Insert pictures into the header and position them over the top of this design theme. Every design theme can be a little different. Sometimes they'll be a single background image covering the entire back of the page. Sometimes they'll be a collage. You can also delete this entire background and then insert your own pictures. This design theme has some shapes in the background as well. what if we want to start deleting out these shapes. You can just click each one and start deleting. And now we have a plain design in the background. We can start from scratch. You can insert your own designed graphic 8.5x11 background picture here. Now let's undo all these deletes and get it back to where it was click and close the header. And that is how you edit documents. Now to save, you probably shouldn't save over the top of our preassembled documents so do a Save As don't do a Save. I'm going to cancel this do a Save As. Save your edited version to your hard drive somewhere. And that is how you edit manually.